In February 2014, The International Olympic Committee (IOC) announced that it has reached an agreement with Panasonic to extend its Worldwide TOP Partnership through to 2024. Panasonic has been a Worldwide Olympic Partner since the IOC’s global sponsorship programme began in 1985, and is the first Partner to sign to 2024. Museum Director Francis Gabet said, “The partnership with Panasonic is not new. It dates from the beginning of the museum. For more than 20 years we have been partners, since we built the first museum together. This partnership has been a great fit. When you are in the Olympic world, you must work with the best and talk to the best in order to produce the best possible experience. At the heart of the renovated museum is a 180⁰ video wall, featuring Olympic memories, famous Olympians and legendary Olympic moments. Set to a pounding beat, the video makes an instant impact and uses five Panasonic projectors, perfectly aligned using edge blending and geometric alignment software, to deliver a seamless cinematic experience. The museum’s curator Frederique Jamolli, said, “When visitors go to the museum, I think that most of them want to relive the emotions of the competition, what happens in the stadiums during the Olympic Games. Overlooking Lake Geneva and representing the sporting hopes of thousands of athletes, the IOC museum has, for 20 years, been a much loved tourist destination. In 2011, 18 years after opening its doors for the first time the museum moved to a temporary home in order for the existing building to undergo an extensive refurbishment. The challenge for the IOC was how to engage a new generation of museum goers used to smart phones, Youtube and multiple sensory experiences. The result, two years later, is a fully redesigned museum, utilising the latest technological innovations and a new themed ‘museographic’ approach. The Olympic ideals remain the theme of the museum, but are now brought to life using interactive displays and video. 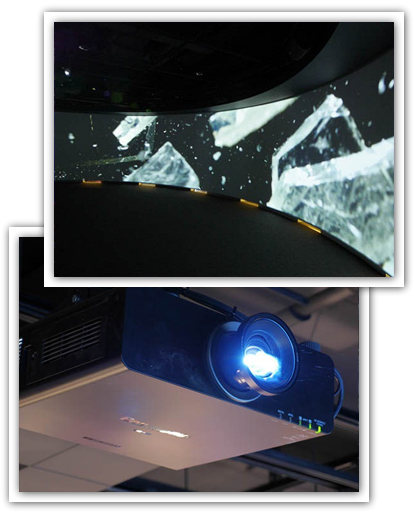 Panasonic delivered over 150 products, including projectors, security equipment solutions and professional digital displays. The new museum features more than 1,500 exhibit pieces in addition to audio-visual, multimedia and other speech mediums. It is the largest archive for the Olympic Games in the world and one of Lausanne’s prime tourist sites, attracting more than 200,000 visitors each year. An established ideology of Panasonic at the Olympic Games is that of “Sharing the Passion", which aims to help nurture the excitement of each moment at the Olympic Games, communicate the passion of the Olympic Games to every spectator and fan so that athletes and audience alike are able to share in the atmosphere of the Olympic Games. 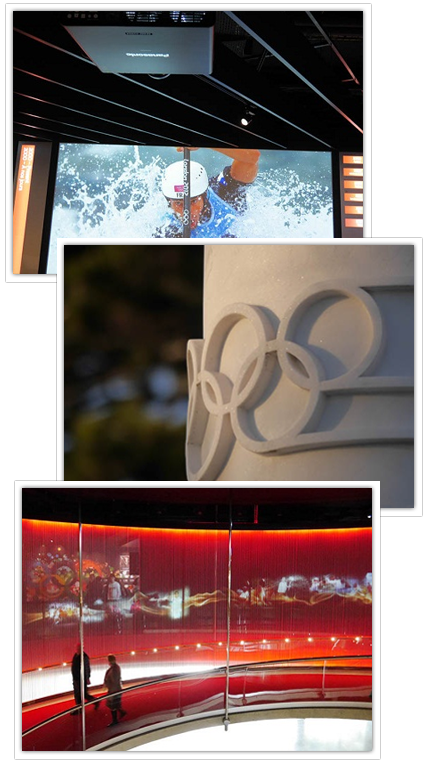 The implementation of the latest state-of-the-art AV equipment from Panasonic will complement the heritage of the Olympic Games by opening a whole universe of knowledge and emotions for visitors, made possible through the latest interactive and multimedia technology. The renovation of The Olympic Museum reflects the ambition to produce a veritable ‘Olympic Games Campus’. Visitors are invited to dive into the history, heritage, dreams, challenges and values which have contributed to making The Olympic Movement what it is today. 5) The skiing equipment of three-time Olympic champion Jean-Claude Killy. Spanning 3000m2, the museum is divided in to three distinct themes on three floors, the Olympic World, the Olympic Games and the Olympic Spirit. Helping display images that evoke visitor memories are 27 flat panel LCD displays, ranging from 42 – 55”. Using digital mapping Panasonic has been able to combine moving and still images, cutting out individual exhibits and displays within a moving video wall. This was important not only so that the visitor’s experience is not affected by glare on the displays, but also so that the original paintings are protected from a constant light source. Essential for the protection of the museum and its 1,500 assets, is the CCTV and security equipment within the museum. Panasonic is a leader in surveillance systems - offering one of the largest ranges of security and video recording systems in the market. With our range of IP, analogue and hybrid surveillance solutions, we helped design and deploy a customised system that best meets the museum’s speciﬁc needs.